Kids are starting to go back to school now or in the near future. With that said, did you know that most children are deficient in EPA and DHA, the omega-3 essential fatty acids in fish oil? These vital nutrients are crucial building blocks of child development and play key roles in every aspect of health, including brain and eye function. 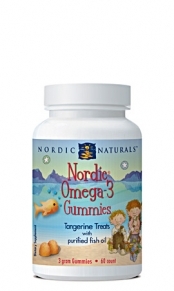 With the help of Nordic Naturals, you can be assured your children get the EPA and DHA they need. 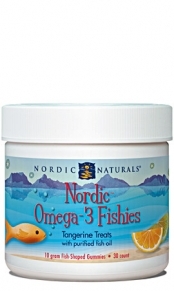 Nordic Naturals’ mission is to deliver pure and great-tasting omega fish oils that promote optimal health and wellness. Through science, education, and community outreach, we initiate standards of excellence and integrity that apply not only to our product line but to all of our business practices worldwide. As an industry leader and innovator, Nordic Naturals strives to lead individuals to a better quality of life while maintaining a deep respect for the environment. I received a whole bunch of Nordic Naturals products and samples to try. These are small fish oil capsules. You are supposed to take 2 per day. They are strawberry flavored so I thought my daughter wouldn't have any issue with trying them. The bottle says you can chew them or swallow. They smelled like strawberry so I told her to put one in her mouth and chew it. Unfortunately, she did not like the taste at all. I tried one just to see what the "problem" might have been and I didn't like it either. While it was strawberry flavored, it was still fish oil and you could taste that. So next we tried swallowing them. My daughter couldn't quite get the hang of swallowing them. She has never had to swallow any pills so I guess she just hasn't learned how quite yet. I ended up puncturing the capsules and putting the fish oil in juice. She had no issues with that at all. These are little gummies that reminded me of gum drops. You are to take 2 of them per day. They are tangerine flavored treats with purified fish oil. My daughter had no issues with these at all. In fact, she often asks for more! These are the same as the gummies but are in a fish shape and you only need 1 of them per day due to their size as they are bigger than the gummies. Again, my daughter has no issues with these and asks for more. Nordic Naturals has formulas for just about everyone out there. They have the above formulas and more for kids. They have a formulas for adults, pregnant ladies and even pets. They have capsules, gummies for kids and liquid forms for those who cannot take pills. I sampled some of the sample packets I received, along with the formulas sent for my daughter, and none of them gave me fishy breath or fishy burps. Thank goodness! Overall, Nordic Naturals products are fabulous, especially for children. Check them out and get your children on fish oil for the upcoming school year. You can purchase these products and more at Nordic Naturals. 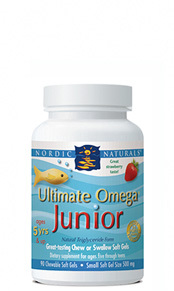 Prices vary but a 30 count container of the Nordic Omega 3 Fishies is $34.95, a 60 count container of the Nordic Omega 3 gummies is $21.95 and a 90 count container of the Ultimate Omega Junior is $29.95. I just bought the Nordic Naturals formula for high cholesterol for my dh. It has the fish oil in it, and I was a bit worried about the burping issue. However, he hasn't complained yet.